Mahler is also the only Jewish composer among the first rank of European classical composers. One might argue that Felix Mendelssohn (1809–1847) also belongs on that list, but as much as I enjoy some works by Mendelssohn, I am not buying it. Richard Wagner’s notorious essay “Jewishness in Music” (1850), published ten years before Mahler’s birth, offers a profound explanation for why the Jewish composers of his time were at best second raters like Mendelssohn: Jews, who were only recently emancipated from their ghettos, were essentially foreigners to European civilization and European music in particular. For European composers, European music was as close to them as their mother European languages. For Jews, European music was as foreign to them as European languages, which they learned largely for practical purposes such as commerce and generally spoke with a distinct Yiddish accent. It is almost impossible to compose first rate literature in any language other than one’s mother tongue. Joseph Conrad and Vladimir Nabokov are among the very few exceptions. (Heinrich Heine’s native tongue was German.) For the same reasons, Jewish forays into European classical music tended toward superficiality, inauthenticity, and crass commercialism. However, as Bryan Magee points out in his classic defense of Wagner’s “Jewishness in Music” in his slender gem of a book Aspects of Wagner  , all of this was bound to change with time. As more Jews rejected the strictures of their tradition and assimilated European languages and culture, including music, from an early age, one would begin to find first rate Jewish creative geniuses in European art and literature. I think that Magee’s list of Jewish creative geniuses is heavily padded, but he was at least partly right. Magee mistakenly believes that Jews are not a genetically distinct group. Nor does he believe that genes shape culture and that genetic differences limit one’s ability to assimilate an alien culture. But genetic traits that might limit Jewish assimilation fall on bell curves, thus there will always be a few Jews who are able to genuinely absorb and constructively participate in European civilization. Mahler was such a Jew. Despite the titanic efforts of Jews to claim Mahler as one their own (an effort eagerly abetted by anti-Semites who want to drive him back into the ghetto), Mahler’s music belongs to the tradition of Austro-German late Romanticism, and no convincing case has been made that Mahler’s compositions contain distinctly Jewish musical elements, with the possible exception of the third movement of first Symphony. Furthermore, Mahler’s music is fundamentally earnest and sincere, even in his settings of naïve folk songs, rather than the typically Jewish alienation and irony that one would expect in such contexts. Mahler was also a convert to Catholicism. He married a Christian woman, had his children baptized, and most importantly, to my mind, wrote music that expresses explicitly Christian ideas, such as his settings of the Wunderhorn Lieder and his Symphony no. 2, “Resurrection,” which would be utterly grotesque and absurd if it were not so heartfelt. One can always, of course, raise doubts about the sincerity of Jewish converts to Christianity, and from a racial perspective holy water alone changes nothing. But conversion can be indicative of a genuine desire to reject Jewish tradition and ethnocentrism and embrace the surrounding culture. One has to judge by the convert’s subsequent behavior, and in a case like Mahler, who made genuine contributions to European culture, the conversion seems sincere. Even in cases when a Jew becomes a bad or indifferent Christian, conversion may be indicative of a desire to be a good European, and as a non-Christian that is what matters most to me anyway. 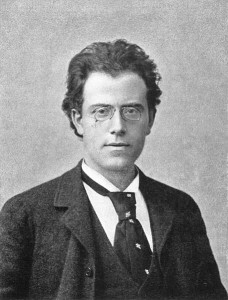 Mahler had a successful career as a conductor and composer. His works were controversial and had their critics, but so did other Romantic pioneers. After Mahler’s death, his works fell into relative obscurity, but this was part of a wider cultural rejection of Romanticism after the Great War. Leonard Bernstein is famous for claiming that he single-handedly rescued Mahler from obscurity in the 1950s and ’60s, which is rubbish. Mahler’s work was kept alive by such non-Jewish conductors as Willem Mengelberg, Leopold Stokowski, Dimitri Mitropoulos, and John Barbirolli, as well as Jewish advocates like Bruno Walter, Otto Klemperer, and Aaron Copland. Yes, Mahler benefited greatly from Jewish ethnic promotion and hype, the most ridiculous excesses of which are ably chronicled by Brenton Sanderson at The Occidental Observer . But more objective Mahlerians also credit such factors as the waning of inter-war anti-Romanticism and the rise of the LP record. Hype can account for brief and ephemeral fame. But the main reason that Mahler has remained among the mostly widely conducted and recorded of composers for the last 50 years is that his music is good. He has stood the test of time. But don’t take my word for it. Listen to Mahler’s music. Last year was the 150th anniversary of Mahler’s birth, which prompted the major labels to release a number of excellent boxed sets of his major works. I recommend EMI’s Mahler: The Complete Works , a 16 CD set which contains some of the greatest Mahler recordings of all time, including such conductors as Furtwängler, Barbirolli, Klemperer, and Rattle and singers like Kathleen Ferrier, Janet Baker, Dietrich Fischer-Dieskau, Christa Ludwig, Elisabeth Schwartzkopf, and Fritz Wunderlich. Deutsche Grammophon also released a highly competitive Gustav Mahler: Complete Edition  , this one in 18 CDs. Although in my opinion, the singers in this edition are slightly less desirable than in the EMI collection, the symphony recordings are slightly better, including Rafael Kubelik’s Symphony no. 1 and Herbert von Karajan’s reading of the 9th. Both sets are available new for less than $3/disc. I want to conclude with four YouTube videos of excerpts from Mahler’s Symphony no. 2, “Resurrection,” which is the first Mahler symphony I heard, and the one that remains my favorite. The first movement is an anguished funeral march. The second movement is pastoral, an escape from grief into nature. The third movement is swirling urban night music, another attempt at worldly diversion which collapses into an outburst of anguish. The fourth movement, “Urlicht” (Primal Light) is a song from the Wunderhorn Lieder, a collection of German folk songs, this particular song about the suffering of earthly life and the joys of heaven. This points the way to the fifth and final movement, in which grief is conquered by Christian faith in the Resurrection of the dead. The recording  is conducted by Leonard Bernstein, whom I usually find annoying. But the orchestra (the London Symphony Orchestra), the soloists (particularly Dame Janet Baker, the mezzo soprano), the setting (Ely Cathedral), and the direction and picture quality are just too good to pass up. Bernstein’s mugging, moreover, is at a comparative minimum, and his tempos are dead right. Je lieber möcht’ ich im Himmel sein. Zum Licht, zu dem kein Aug’gedrungen! Sterben werd’ich, um zu leben! To God will it lead you! Now, to end on a slightly ironic touch, Mahler’s “Resurrection” symphony has been resurrected in the most unlikely place, in Laibach’s song “Das Spiel ist Aus” (The Game is Up). Here is a video, followed by the lyrics in German and in English translation. I have rendered the lines that have been adopted from the Resurrection symphony in bold. Their originals in the Mahler symphony reprinted above have also been rendered in bold. Und unser Spiel ist aus. Raus! Das Spiel ist aus! Man lives in great pain! Man lives in great need! And our game is up.